Maintainers of Linux distributions do an amazing job packaging applications for users, so that "apt/dnf install openbabel" makes software packages available for use within seconds. The only downside is that the version of the software may be older than desired, due to the infrequent release schedules of many distros combined with the infrequent release schedule of Open Babel itself. To bridge the gap for such users, I have created a snap package for the latest release of Open Babel. For those distros that support snapd, "snap install openbabel" will install it and typing "openbabel." and hitting tab a few times will list the executables, e.g. 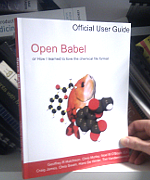 "openbabel.obgui". Um, this is all in theory. If you actually get this to work on a distro other than Ubuntu, please leave a comment below. 1. Snaps run in some sort of security sandbox. As far as I understand, the executables I have created can only read/write files in the user's HOME directory (and subdirectories). 2. Right now, I don't include the libraries or include files. This may come with time. 3. Similarly, right now I've only packaged the release version. Snaps are a good way to distribute nightly-builds or snapshot releases and this might be something to look into in future.